President Barack Obama outlined a broad sweep of second-term goals, from gun control to climate change to revamping the tax code, in a second inaugural address Monday that invoked the country's long battle over civil rights and signaled his commitment to core progressive causes. In the signature moment of a day of pomp and tradition, Obama spoke to hundreds of thousands of people gathered in front of the U.S. Capitol, using the refrain “our journey is not complete” to draw lines from the work of the founding fathers and Martin Luther King Jr. to contemporary battles over gay marriage, immigration rights, voting laws and fair pay for women. "That is our generation's task: to make these words, these rights, these values — of life, and liberty, and the pursuit of happiness — real for every American," Obama said. Read: President Obama's inaugural address. He didn't get into details about his policy objectives, mostly relying on rhetorical flourishes aimed at inspiring a country still mired in the economic doldrums and suffering from a deep political divide. Obama is expected to offer more specifics in his State of the Union address on Feb. 12. Obama echoed several themes he made during his re-election campaign last fall, which ended with a resounding victory and a recharging of his political momentum. He stressed the importance of government's role in an economic recovery, promised to defend entitlement programs like Medicare, Medicaid and Social Security, called for greater reliance on sustainable energy sources, promised an emphasis on diplomatic engagement with foreign enemies and called for a withdrawal from "perpetual war." By bringing up gay marriage, climate change and strengthening the government's safety net, Obama indicated that he would pursue a left-leaning agenda for the next four years. "Our country cannot succeed when a shrinking few do very well and a growing many barely make it," the president said. Read: Richard Blanco's inaugural poem. The inauguration took place on a national holiday, Martin Luther King Jr. Day. The timing represented a unique opportunity for Obama, who is still negotiating his role as a "post-racial" black leader, to show African-Americans that he remains focused on issues of inequality. 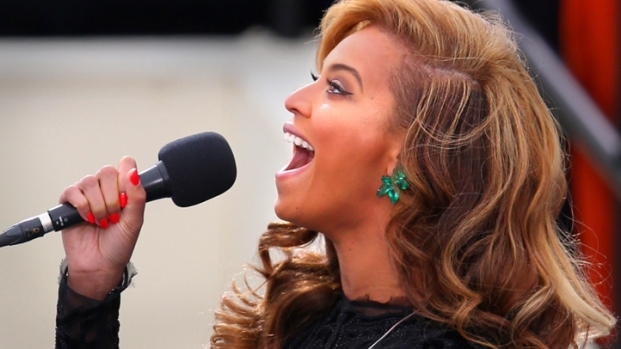 Pop star Beyonce performs the National Anthem at President Barack Obama's second inauguration. After the performance, there have been questions about whether the singer lip-synced. The first black president paraphrased King's "I Have a Dream" speech, which was delivered nearly 50 years ago across the National Mall at the Lincoln Memorial. He also mentioned touchstones of the women's rights and gay rights movements. "We, the people, declare today that the most evident of truths, that all of us are created equal, is the star that guides us still," Obama said. "Just as it guided our forebears through Seneca Falls, and Selma, and Stonewall; just as it guided all those men and women, sung and unsung, who left footprints along this great Mall, to hear a preacher say that we cannot walk alone; to hear a King proclaim that our individual freedom is inextricably bound to the freedom of every soul on Earth." With the speech, Obama set out on his second term as a battle-tested but emboldened leader who is still chasing the grand vision he laid out four years ago, when he promised to lead an anxious nation on a path to greater hope, unity and prosperity. This time around, the Inauguration Day festivities, and the country's expectations, were more modest, with about half as many people expected to converge on the National Mall and Obama working to fulfill his original promise. But Obama seemed invigorated by the prospect of another four years to accomplish what he hadn't in his first term. There was a bit of defiance, too, as when he took thinly veiled swipes at Republican critics, including his former campaign opponent Mitt Romney, who've accused him of forcing more government into people's everyday lives. Government safety-net programs "do not make us a nation of takers; they free us to take the risks that make this country great," Obama said. He referenced the signers of the Declaration of Independence, and the leaders of the Civil Rights era, to make the argument that America can never reach its full potential if it abandons the notion of equality for all. "It is now our generation's task to carry on what those pioneers began," Obama said. "For our journey is not complete until our wives, our mothers, and daughters can earn a living equal to their efforts. Our journey is not complete until our gay brothers and sisters are treated like anyone else under the law - for if we are truly created equal, then surely the love we commit to one another must be equal as well. Our journey is not complete until no citizen is forced to wait for hours to exercise the right to vote. Our journey is not complete until we find a better way to welcome the striving, hopeful immigrants who still see America as a land of opportunity; until bright young students and engineers are enlisted in our workforce rather than expelled from our country. Our journey is not complete until all our children, from the streets of Detroit to the hills of Appalachia to the quiet lanes of Newtown, know that they are cared for, and cherished, and always safe from harm." The speech followed Obama's ceremonial oath of office, administered by Supreme Court Chief Justice John Roberts. Obama took the oath with his left hand on two Bibles, one used by Abraham Lincoln and the other by King. Officially, Obama started his second term on Sunday, when he took the formal oath of office in a private ceremony in the East Room of the White House. That twist was due to the fact that the Constitution mandates presidential terms begin Jan. 20. Custom holds that when that date falls on a Sunday, public inauguration events are held the next day. As the capital filled with people on Monday morning, Obama started his day with his family and Vice President Joe Biden at St. John's Episcopal Church, a few blocks from the White House. During his arrival at church and his departure, cheers erupted from people on the streets, and it continued as Obama returned in his motorcade to the White House for a pre-oath coffee with Congressional leaders. Only two of four living former presidents made the trip to the Capitol Monday. Bill Clinton showed up with his wife, Secretary of State Hillary Clinton. So did Jimmy Carter. Obama’s predecessor, George W. Bush, stayed behind to look after his father, George H.W. Bush, who is recovering from an illness. As in 2009, Monday's festivities had a Hollywood feel. Beyoncé, who sang the National Anthem, and her husband, rapper Jay-Z, chatted with Rev. Al Sharpton before the ceremony started. Actress Eva Longoria was seated on the platform outside the Capitol, not far from singers Katy Perry and John Mayer. The program included performances from musicians Kelly Clarkson and James Taylor. Also spotted in the crowd was former Boston Celtics great Bill Russell. The crowd for the country's 57th presidential inauguration was expected to reach about a half-million people, an impressive size but considerably smaller than the 1.8 million who showed up to witness the arrival of America's first black president in 2009. Security remained just as tight as it was then, although authorities say there are no credible threats of any attack, terrorist or otherwise. 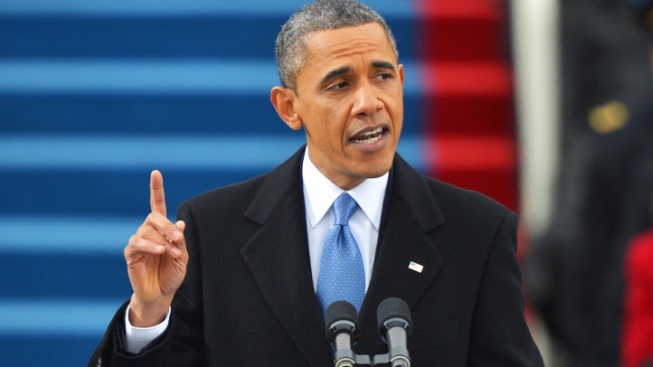 Obama clearly meant his speech as a pep talk to a country that is in need of one. Spurred by the schoolhouse massacre in Newtown, Conn., Obama has put gun control at the top of his agenda, along with reforming immigration and tax laws and taking on climate change. He is also about to begin another battle with Congress over the debt limit and automatic spending cuts. "Progress does not compel us to settle centuries-long debates about the role of government for all time," Obama said. "But it does require us to act in our time." Later in the afternoon, after an inaugural luncheon event with Congressional leaders in the Capitol building, Obama and Biden appeared outside with their wives and stood with their hands over their hearts as a procession of military color guards passed. They then got into a bulletproof Cadillac limousine known as “The Beast” and headed to front of the inauguration parade, making the 1.2 mile trip from the Capitol to the White House at a snail’s pace to allow the public a good look – albeit from behind a thick cordon of active and reserve troops, federal agents and state and local police. About halfway through the route, outside the FBI headquarters, Obama and the first lady got out of the limo, locked hands and walked down Pennsylvania Avenue, waving to the thousands of people who lined the street. They emerged again near the route’s end, strolling together toward the White House gates. Later, joined by their two daughters, climbed into the presidential view stand to watch the remainder of the parade.